The paperweights on this page are from unknown factories, especially those where I cannot even establish a country of origin. 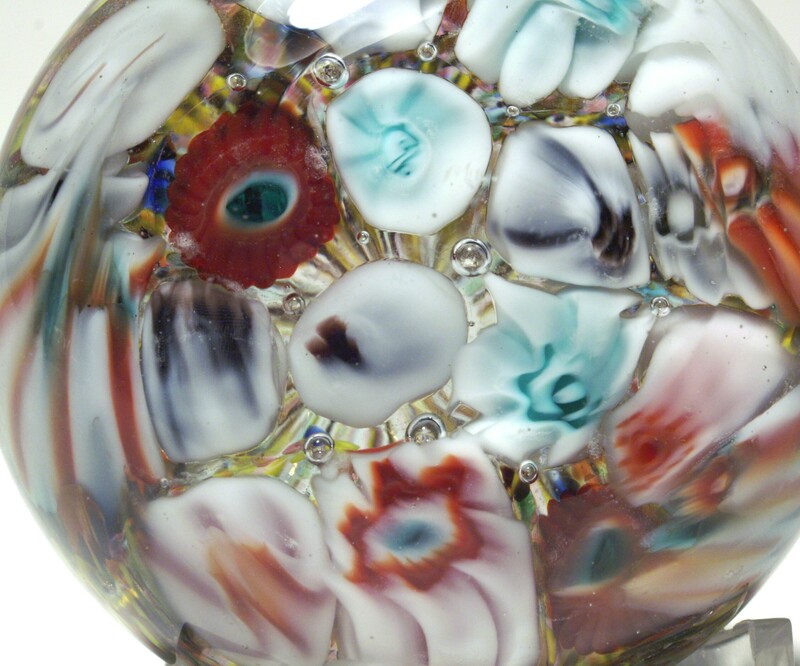 Some of these are inexpensive fun paperweights. If you know more about any of these, please let me know. 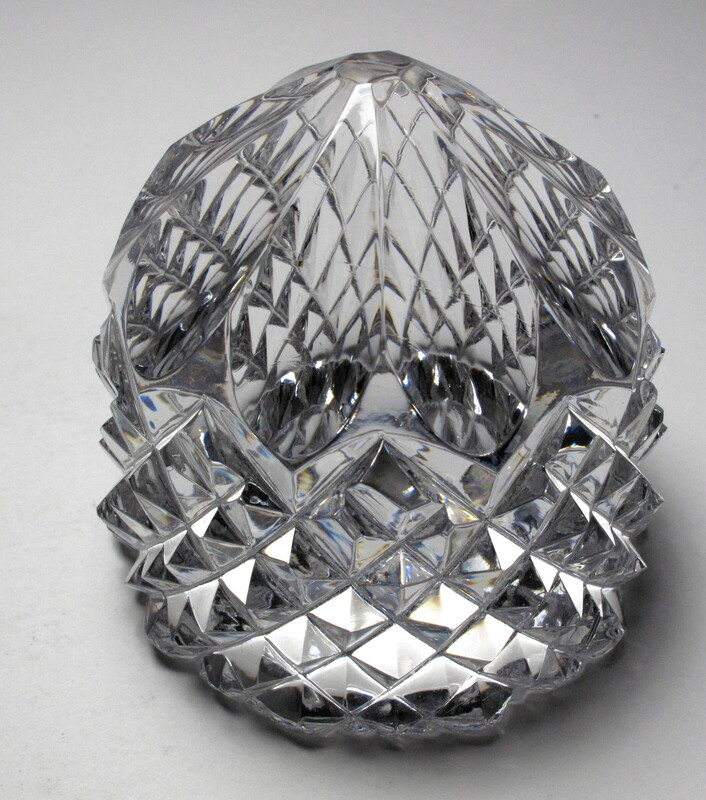 4687 Cut Crystal Paperweight from Unknown Factory, possibly made by Klokotschnik. circa 1980s. 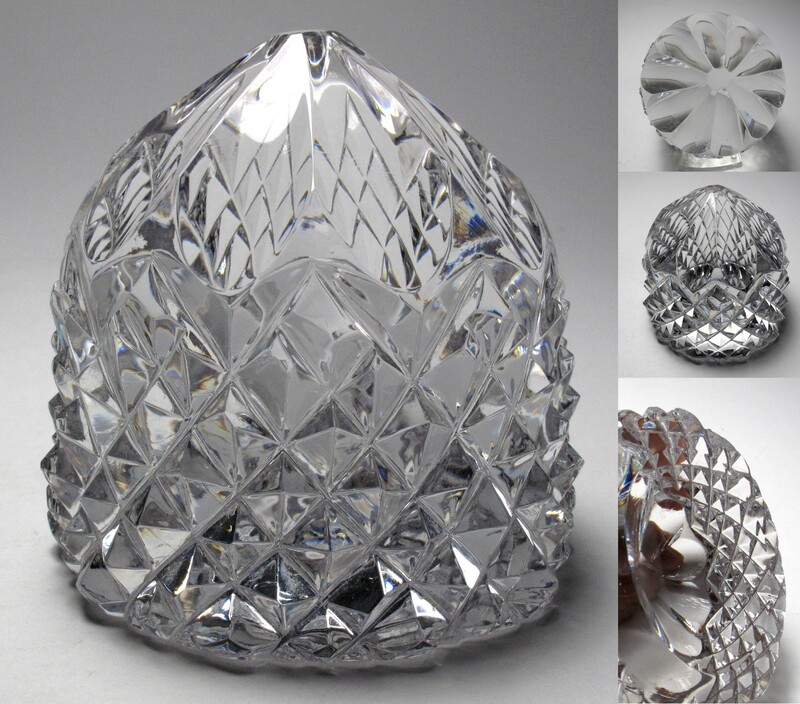 This is a large heavy crystal paperweight with extensive faceting and cuttings. 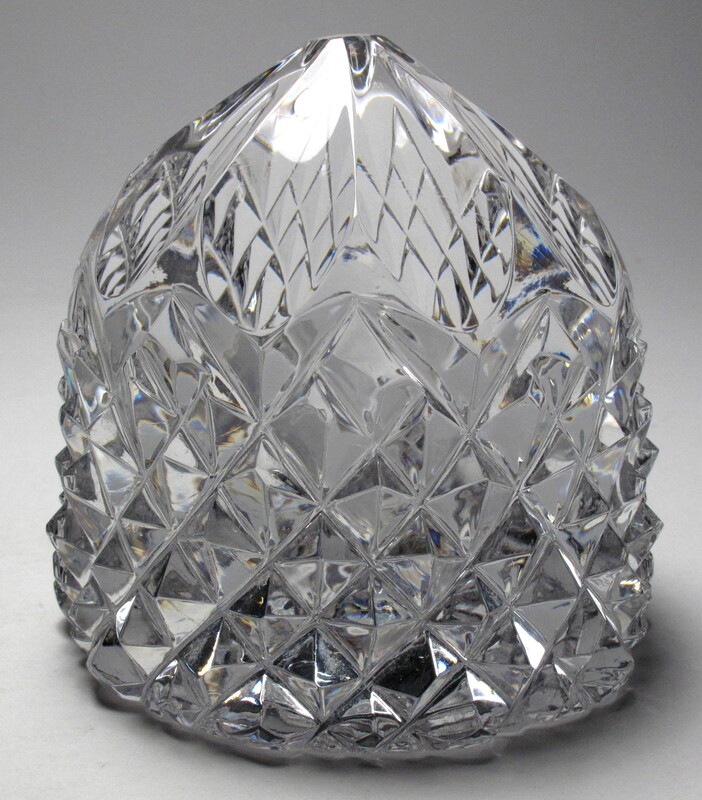 I believe at least some of the facets are cut crystal. 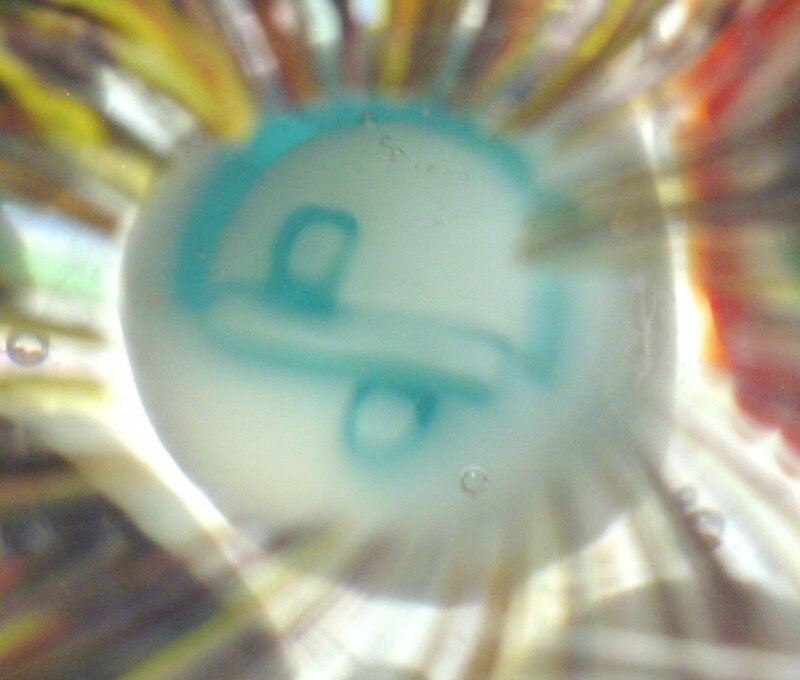 It is not signed, but I have seen similar items made by Klokotschnik Glashütte in West Germany. 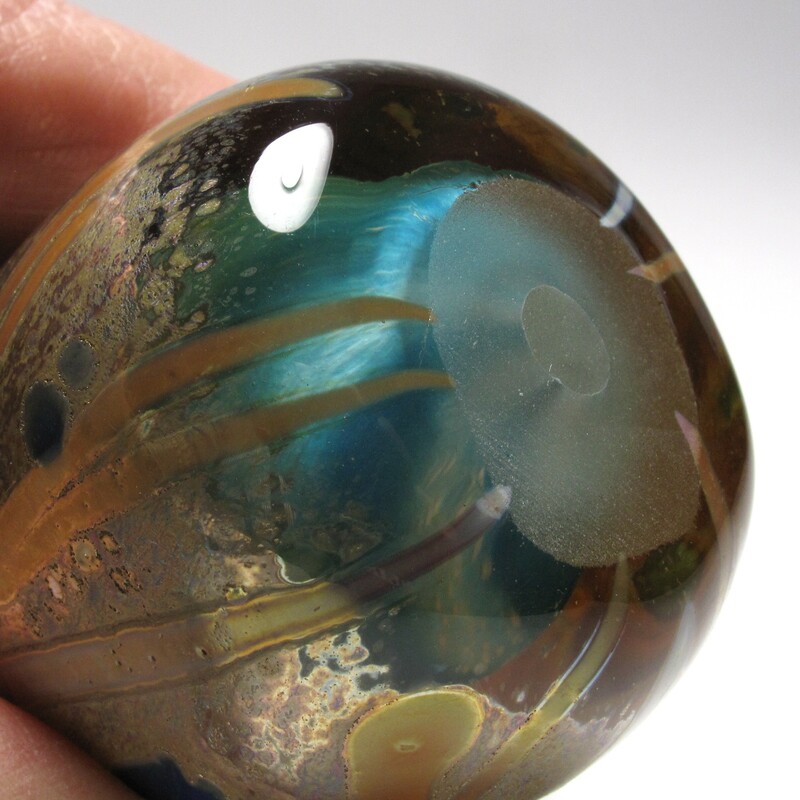 A fun paperweight from an unknown maker. Note: I don't know anything about the Klokotschnik company except that similar items have labels that say "GLASHÜTTE MANUFAKTUR - KLOKOTSCHNIK - 30% Bleikristall mundgebl handgeschl". Collectors have told me they purchased these items from the now defunct House of Tyrol in Georgia, an importer that specialized in selling gifts and collectibles from Germany and Austria. The House of Tyrol closed in 2003 after more than 25 years. I welcome corrections to this information. 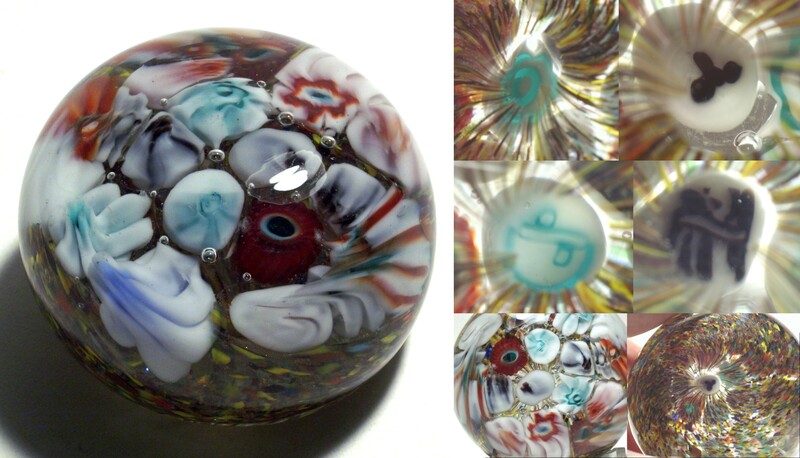 Large Size: 3" diameter by 3" tall. The base is finished concave with a flat shoulder. 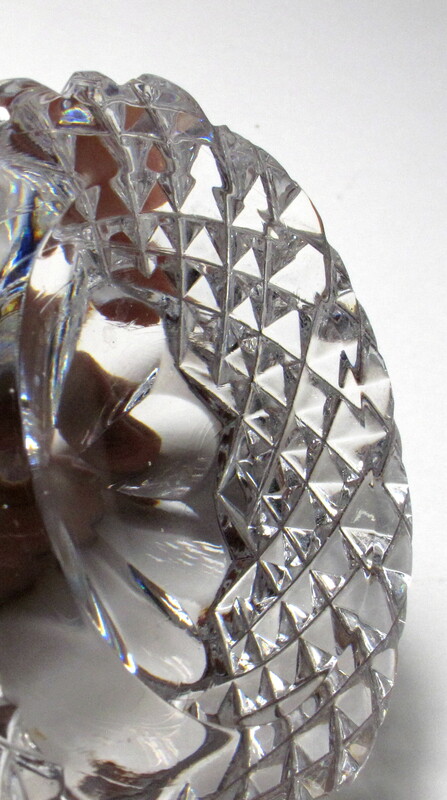 The entire surface is faceted. It is heavy and weighs 26 ounces. Condition: Excellent condition with no chips, cracks or scratches found on inspection. Signature: Unsigned. 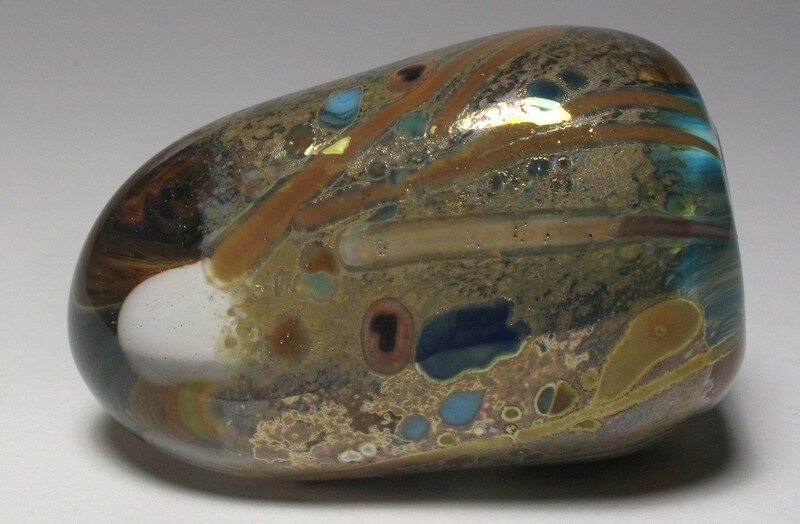 I do not know the age, maker, or country of origin for this paperweight for sure. 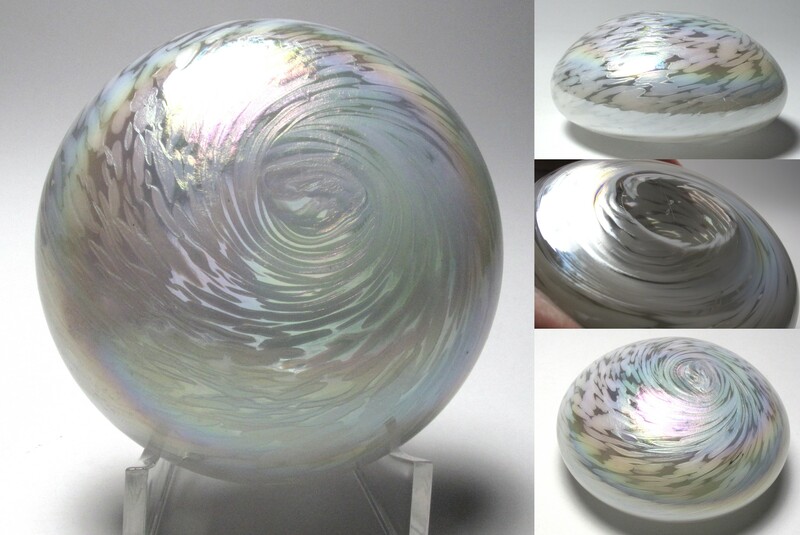 4947 Large White Iridescent Swirl Paperweight by Unknown Maker. 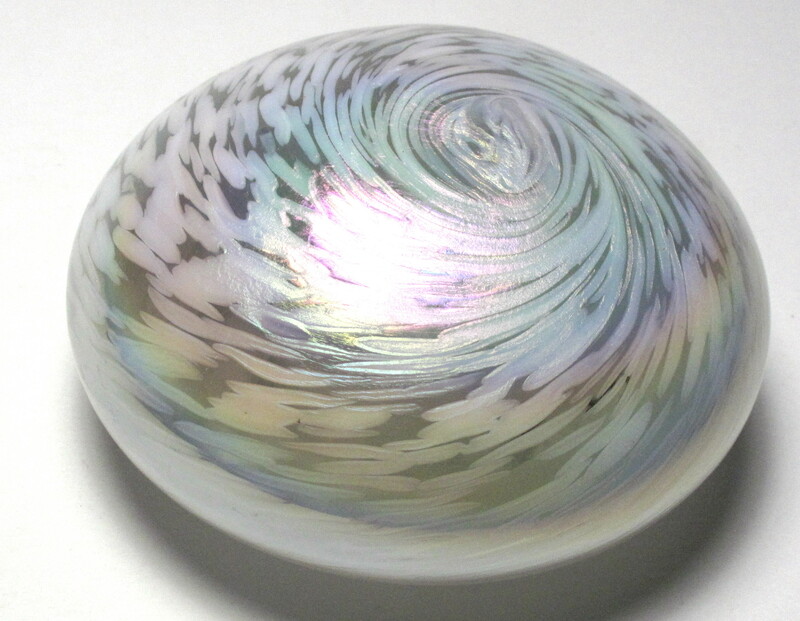 This is a large white iridescent paperweight with a swirl pattern and a slightly textured surface. 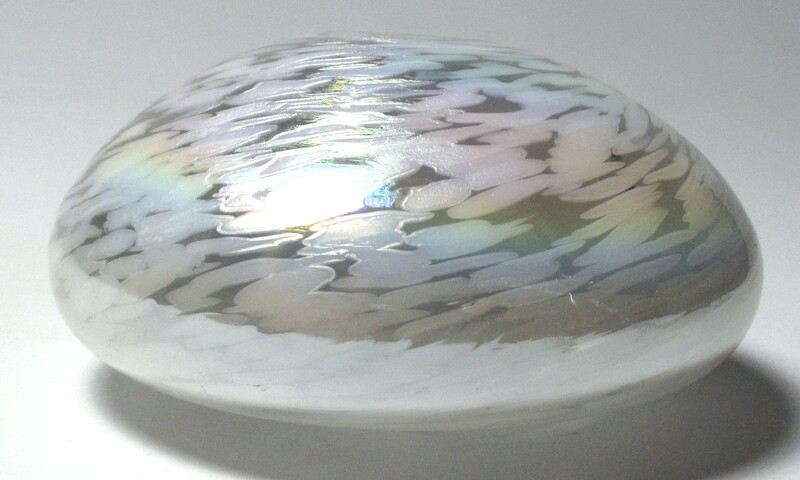 The colors are white and clear, but the iridescence causes the surface to appear to gradually change colors as the angle of view or the angle of illumination changes. The profile is relatively flat. The paperweight is unsigned, but I suspect it dates from the 1970s. 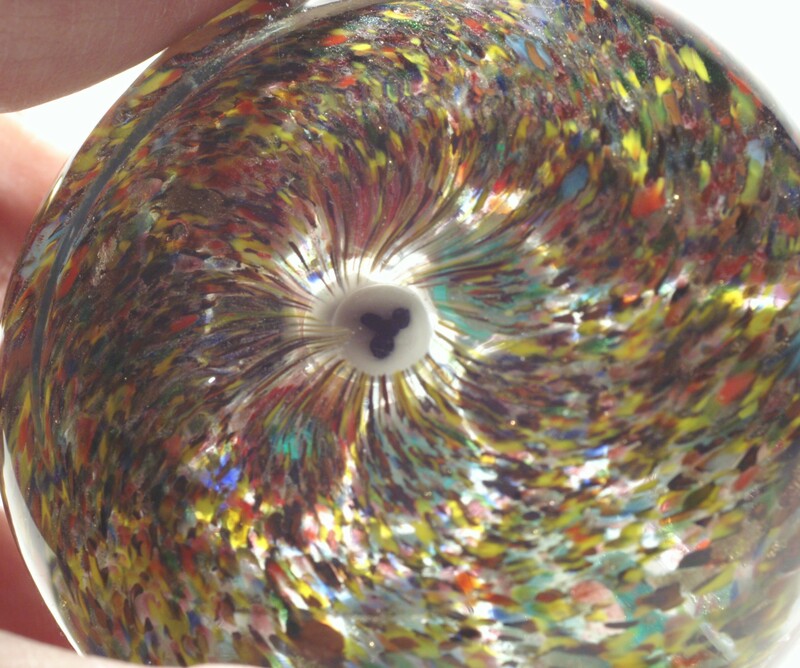 A delightful paperweight from an unknown maker. 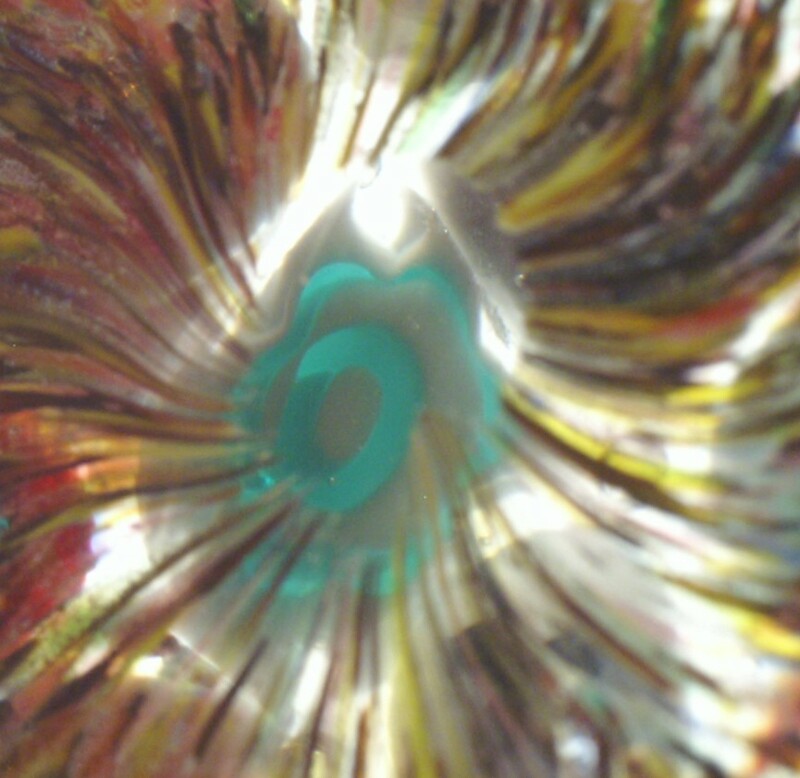 Iridescence is a hard property to describe. 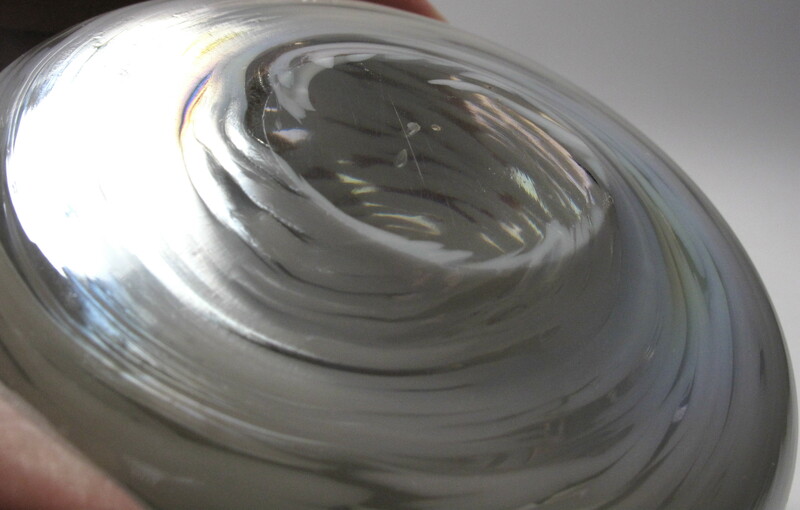 The surface reflects light in a way that changes colors much like soap bubbles, butterfly wings and the inside of sea shells. 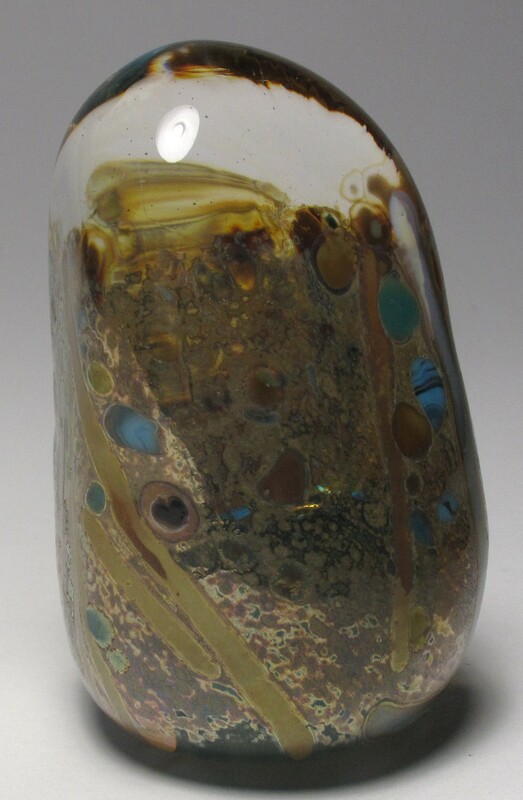 Large Size: Just over 3 1/16" diameter by just over 1 9/16" tall. The profile is flat and the base has been ground flat. Condition: Excellent condition with no chips, cracks or scratches found on inspection with the exception of a few scratches on the base. The surface is textured which makes inspection for scratches difficult. Signature: Unsigned. 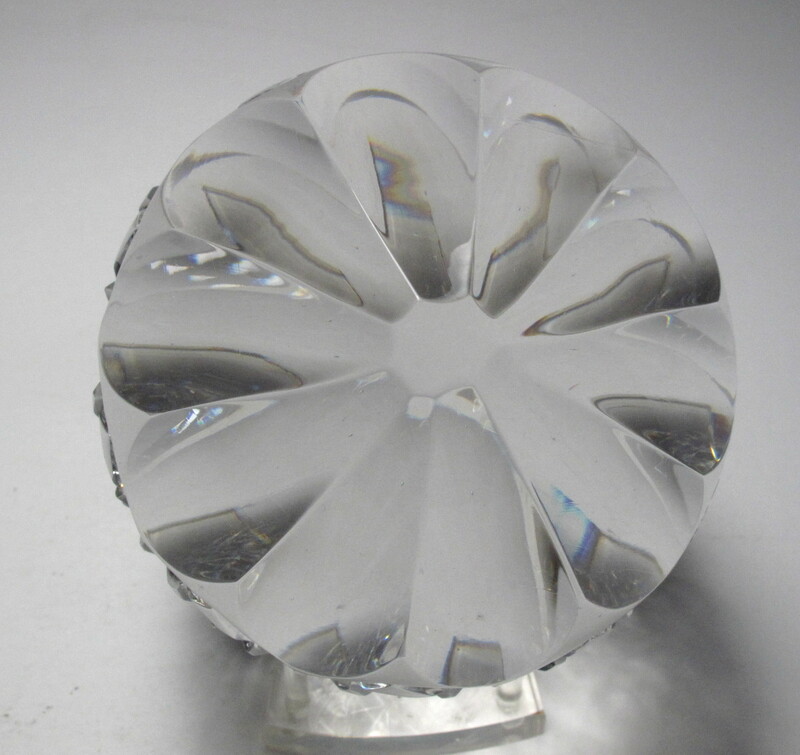 I do not know the age, maker, or country of origin for this paperweight. 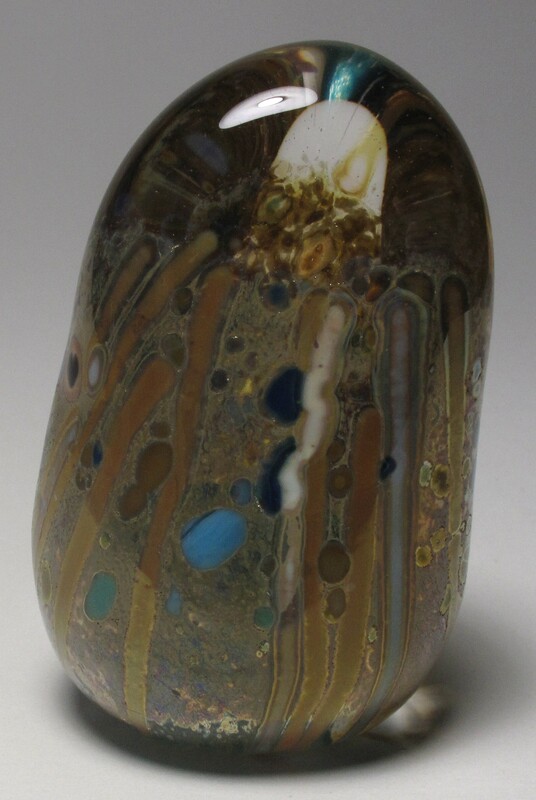 It was part of a collection that dated from the 1960s and 1970s. 4753 Unknown Maker Small Surface Decorated Paperweight with Heart Canes. circa 1960 - 2000. 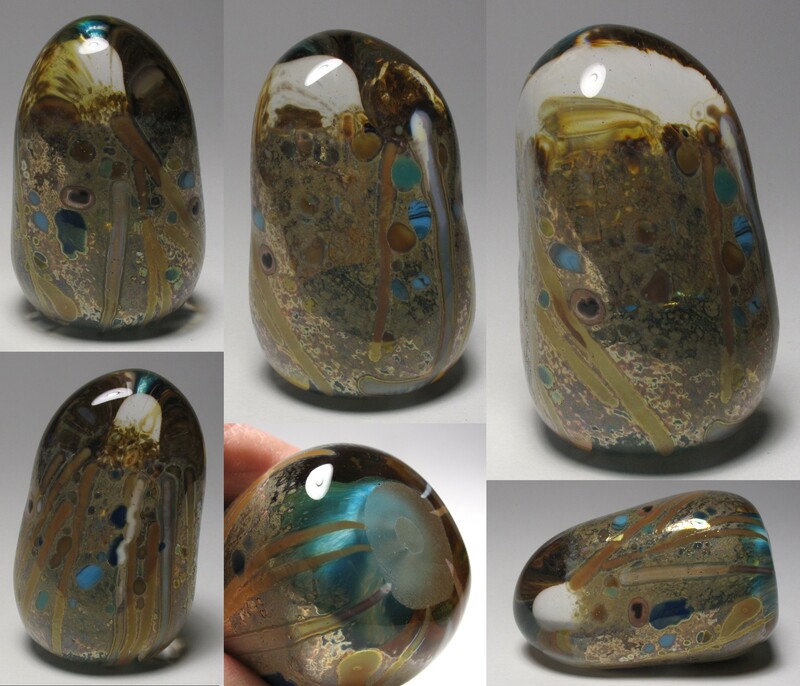 This is a small three sided paperweight with a turquoise center/ground. There are stringers and pieces of glass applied to the gold colored surface plus three heart canes. No signature other than possibly the heart canes. A very interesting paperweight. 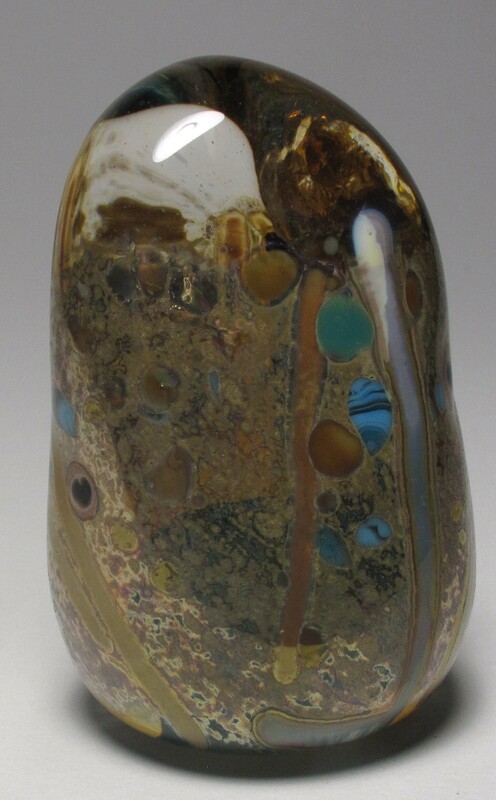 Small Size: 2 5/8" high by 1 3/4" at the widest. The base is ground flat. Condition: Excellent Condition. No cracks or chips or scratches found on inspection. Signature: Unsigned. I do not know the maker or country of origin. 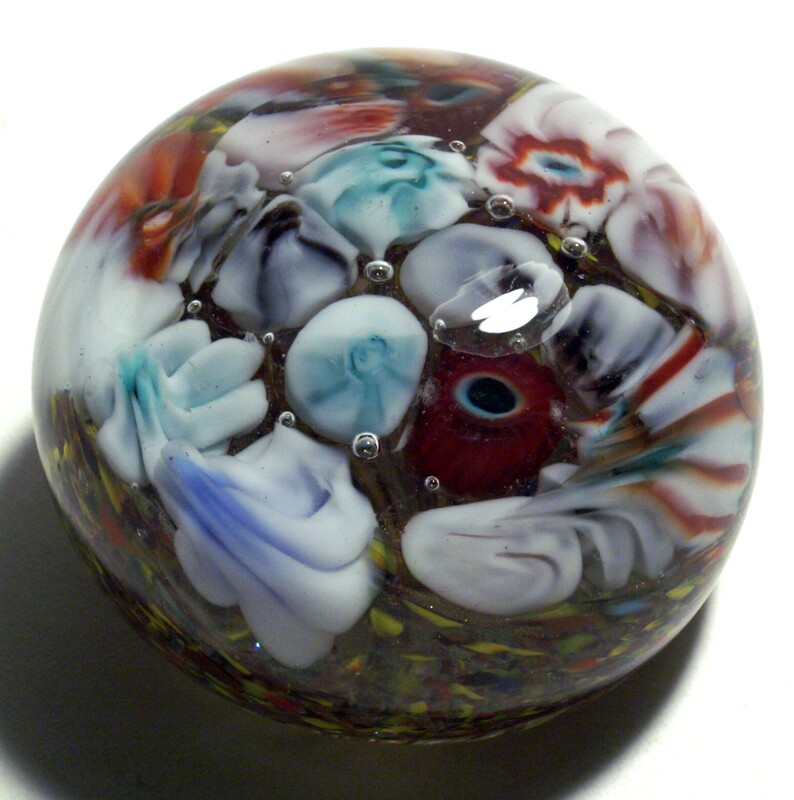 4219 Mystery Millefiori Scramble Paperweight with Character Canes from Unknown Maker - possibly Antique. vintage or antique. This is a mystery paperweight. 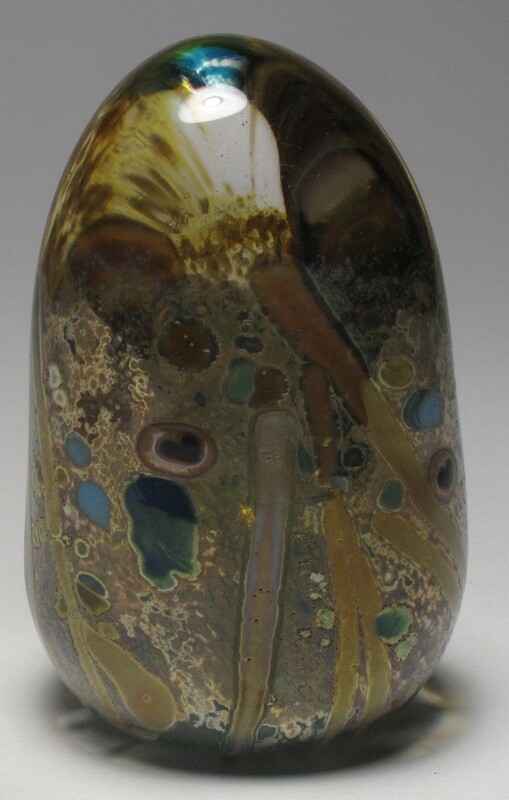 At first glance, I thought this might be a 1960s Murano scramble due to the glittery aventurine and frit ground The weight is a scramble with smudged canes placed over a frit ground. When viewed from the bottom, there is a void in the frit where the pontil scar has been ground off. When I look through the void I can see character canes that are unfamiliar. There are at least six well defined mystery canes. 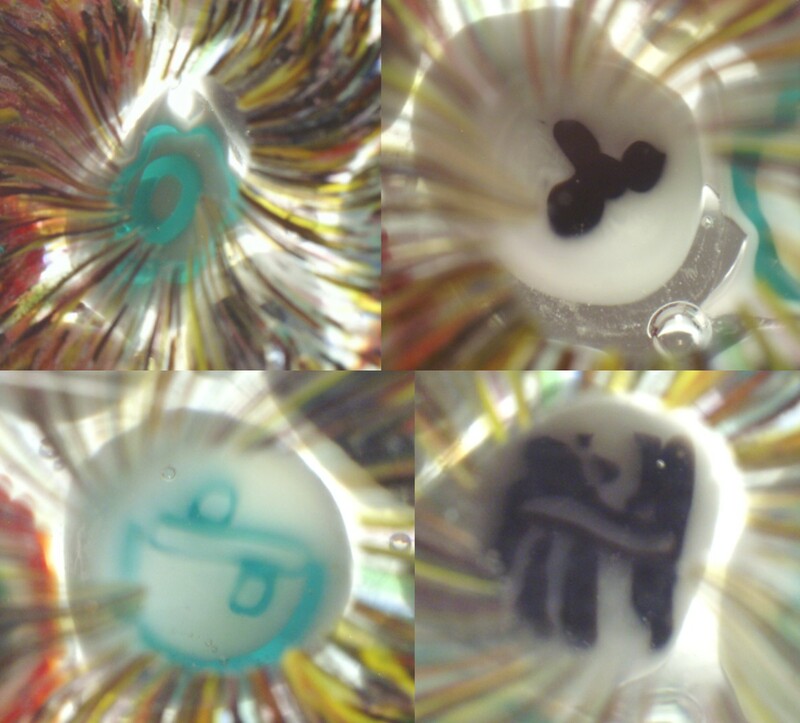 I was able to capture pictures of four of them, the others are just as interesting. 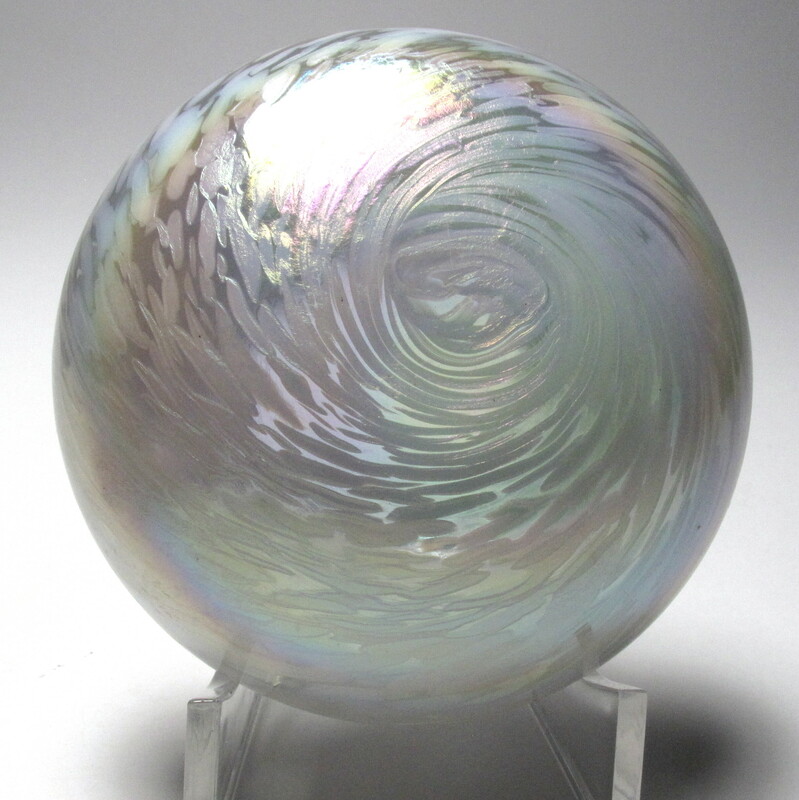 Large Size: 2 3/4" diameter by 1 7/8" high. The base is flat with the center ground concave. Condition: Very good to excellent condition. No chips, cracks, noticeable scratches. 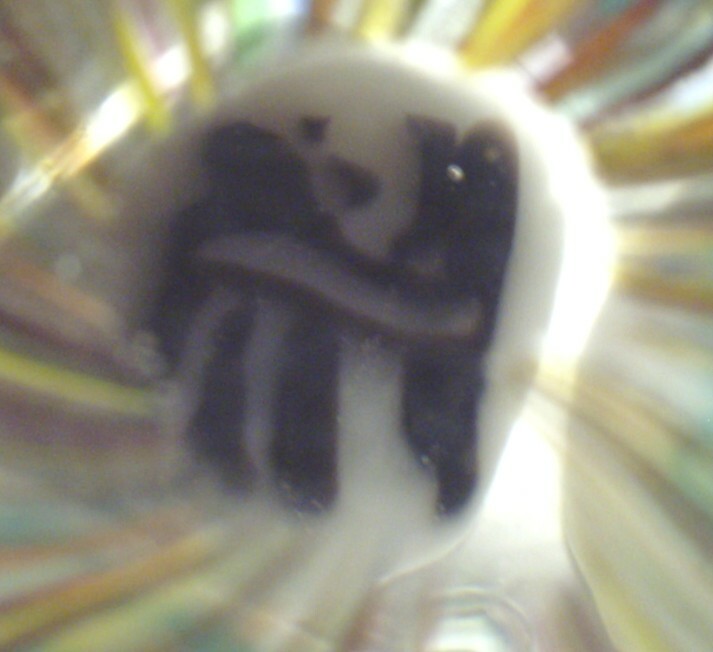 There are some tool marks on the dome and some striations within the glass. Signature: Unsigned, but not likely to be made recently. I believe this was made earlier than the 1970s, possibly even in the early 1900s. $145 postage paid in the US.